EAGLE COUNTY, Colorado –A new coalition in Eagle County has at least 60 local children smiling a little wider within the last couple of weeks. Eagle County Smiles is a group helping local children without access to dental care get their teeth cleaned and fixed. It’s an idea that has been in the making since 2007 and has only now found a more permanent solution to the dental van that used to roll through the valley for just six weeks each summer. “It’s going really well,” said Karen Simon, executive director of the Vail Valley Charitable Fund, the organization that is leading the coalition. The dental van wasn’t a good permanent fix because children who needed repeat visits to a dentist for more complex care wouldn’t have anywhere to go once the van left the valley, Simon said. The new program, which includes participation from 14 local dentists, one endodontist, one dental hygienist and one oral surgeon, means children have a place to go for care, Simon said. Simon and Eagle County Public Health Nurse Supervisor Bethany Van Wyk spent a lot of time trying to build relationships with local dentists in the valley. Each dentist who has signed on has committed to see 20 children per year in their offices, and the coalition pays each dentist the same amounts they would get from Medicaid. The patients have to pay a $25 co-pay to the dentists, and that’s it. “We have 60 kids in the system already,” Simon said, adding that she expects as many as 225 children receiving care through the program by next June. Simon said she takes referrals from a network of people, including school nurses, providers at the Eagle Care clinic, public health nurses and other nonprofit organizations. Salvation Army Executive Director Tsu Wolin-Brown said they’ve already referred three families to the program, including one family in which both parents are unemployed and they have five children in need of dental care. The mother of that family couldn’t come up with all of the co-pays just yet, so she sent her two children who needed the care most to see dentists first. “They know how important (dental care) is,” Wolin-Brown said. David Maloley, a local dentist involved in the program, said dental problems can lead to a host of other problems, including increased risk for stroke and heart disease. “The mouth is truly connected to the rest of the body,” Maloley said. 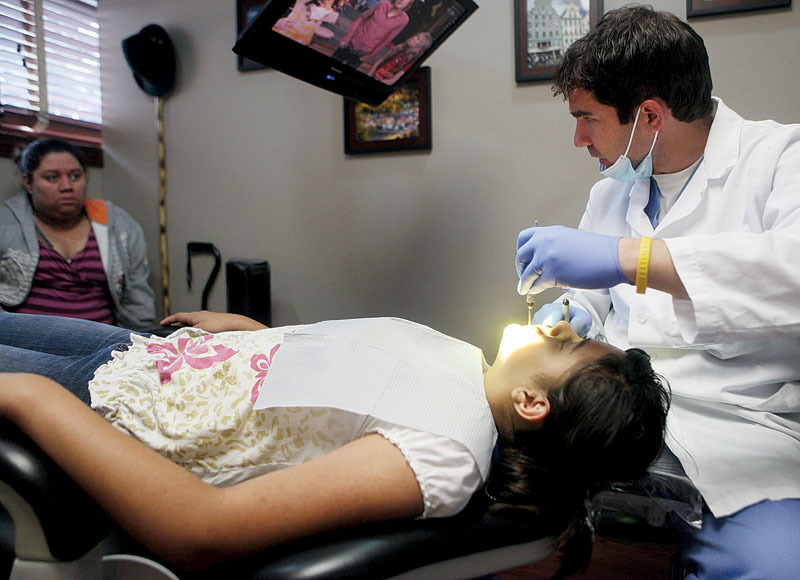 Dentists involved in the program are doing more than just treating mouths, they’re also educating children and their families about oral hygiene. “We want to get everyone to a healthy place, so they’re able to control their oral health care at home,” Maloley said. Simon said the goal is to help any child who needs it, whether it’s something as simple as a teeth-cleaning to something more serious. The saying that hungry children can’t learn is true, Simon said, yet children with tooth decay can’t eat because it hurts. She hopes that teachers or school nurses who notice children with aching teeth or other dental problems will refer them to the program. Simon credits all of the dental health professionals for getting the program rolling. While some funding and a coalition of people with the right ideas helped, the dentists and specialists are making the dream a reality. “We have been just amazed at the support we’ve gotten in the last couple of months from local dentists. I think they’re all finding it’s a really rewarding experience,” Simon said. Community Editor Lauren Glendenning can be reached at 970-748-2983 or lglendenning@vaildaily.com.